May 5, 2004. 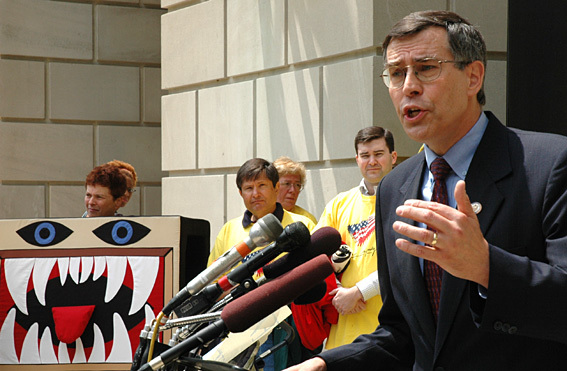 Congressman Rush Holt (D-NJ) speaks during the press conference outside of the Election Assistance Commission (EAC) hearing on the status of computerized electronic voting systems. He has introduced the Voter Confidence and Accessibility Act, H.R. 2239. Among its provisions the bill would require voting systems to "produce a voter-verified paper record suitable for a manual audit equivalent or superior to that of a paper ballot box system." To Holt's right is an activist dressed up in a "Computer Ate My Vote" costume; before the press conference began she demonstrated the effects of hacking and software meltdowns. 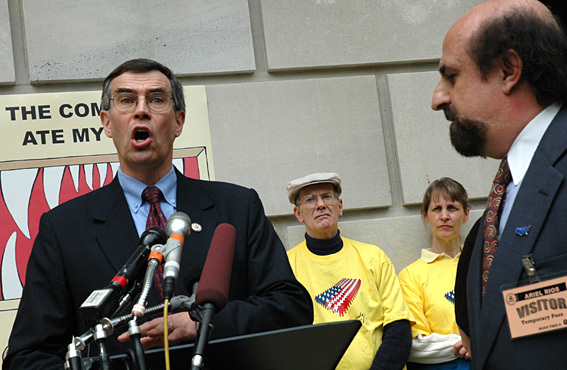 Below, Congressman Holt defended his bill after Jim Dixon of the American Association of People With Disabilities, who is blind, challenged him about its ramifications.